At the last Council Meeting, the Toms River Governing Body presented proclamations for life-saving efforts during a house fire that occurred on Thursday, December 13th, 2018. The fire occurred at a home located on 73 East Rolling Hills Court in Toms River. The initial call came from a neighbor, who reported seeing flames and smoke coming from the garage. When fire crews arrived, the garage was fully engulfed and there were reports of a woman trapped inside the home. Neighbor Joe Mahon along with Tim Dalton, Joe Hayward, Dave Gretkowski, three Toms River Township employees from Public Lands who were working in the area, Police Officer Andrew Gannon and Toms River Community Service Officers Elmandoh Kandil and William Miller were able to coach the woman to follow their voices to a first floor window of the house, where she was able to escape. 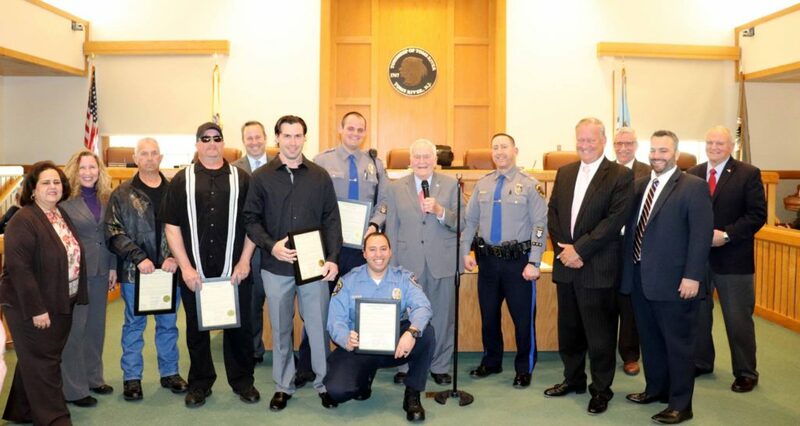 The Mayor Thomas F. Kelaher and Governing Body do hereby recognize with respect and gratitude, Township of Toms River Police Officer Andrew Gannon, Township of Toms River employees Joe Hayward, Dave Gretkowski, Tim Dalton and Community Service Officers Elmandoh Kandil and William Miller for saving the life of Alyssa Hollingsworth and for their bravery and their courage.